What I didn’t tell you in my New Year’s Eve post yesterday was that my goal on New Year’s Eve is always to find the closest thing to Times Square in Kansas City. And that’s what I had in mind when I mentioned that after having dinner in Parkville, I wanted to stop by KC Live! and Union Station — the two places where the biggest stroke-of-midnight crowds would be assembled. Minutes after I published that post, Patty firmly rejected the idea of KC Live!, saying it was going to be too cold. I didn’t argue but thought, OK, there’s still Union Station. Union Station had been advertising its annual “New Year’s Swingin’ Eve” celebration — $120 per person — in the Grand Plaza, formerly the North Waiting Room. I countered by saying yes, it would be loud, but it would be a big, boisterous gathering where we undoubtedly would run into people we knew. “We won’t see anybody we know,” Patty said flatly. “I’ll take that bet,” she said. At that point, I figured that even if I lost the bet, I had prevailed in the “go-don’t go” argument. We arrived at Cafe des Amis a little before 8:30 and were soon joined by longtime friends Cindy and Bill Molini, who live in Lawson. Cafe des Amis is quite a treasure for Parkville. It’s a 30- to 45-minute drive from Brookside, depending on traffic, but it’s a warm and cozy place, and the food is excellent. It’s owned and run by a French couple named Ingrid and Guillaume Hanriot. Ingrid is in charge of the kitchen, and Guillaume oversees the tables areas and serves customers, along with several other wait-staff members. As I expected, the restaurant was bustling and busy. Our table was in a room that had five or six tables, and it was quite loud. Even with my hearing aids turned up a notch, I had to cup my ear to hear Cindy and Bill across the table. The principal offenders in the noise department were two of three people who were sitting at a table 8 to 10 feet from us. At one point, the lady was on the Internet reading something off her phone. She was talking at such a level that she might as well have been announcing at Arrowhead Stadium. After a few glasses of wine, her husband assumed the announcing chores. Toward the end of our (and their) two-and-a-half hour stay, he was bellowing about Jesus (whom he liked) and President Trump (whom he didn’t like). The third person at the table, an elderly man who didn’t seem to say much, functioned as the loud couple’s audience. Time had whizzed by, and to my surprise it was almost 11:40 by the time we left the restaurant and started back to town. 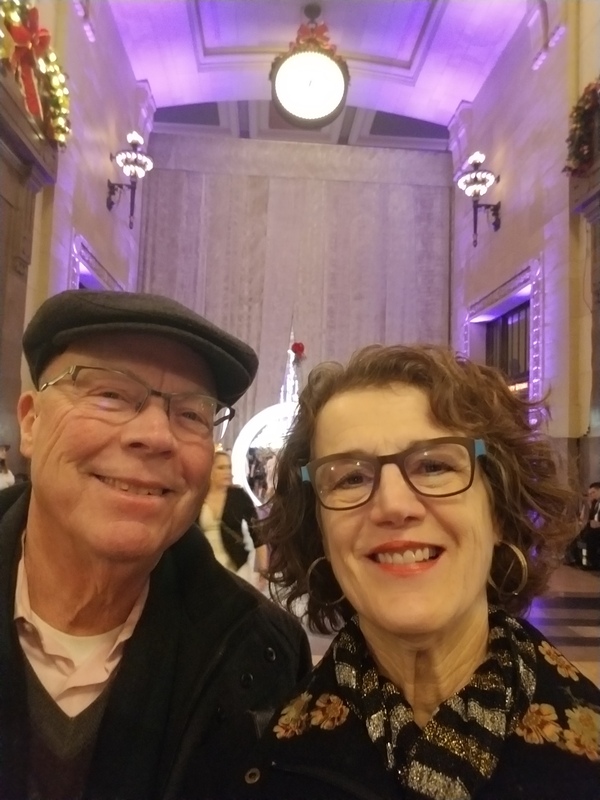 To my dismay, I realized we weren’t going to make it to Union Station for midnight and that, for the first time, in our 33-year marriage we would be observing the turn of the calendar in an automobile. Traffic was light, and we moved right along, but still at 11:58 we were on Broadway approaching Pershing Road. Patty, being very resourceful, had been punching buttons on the radio looking for a station that featured something akin to a New Year’s Eve observation. To our delight, 90.9 FM, “The Bridge,”was playing Frank Sinatra’s recording of”New York, New York.” So, we celebrated the first moments of the new year singing along with Frank and exchanging a quick kiss while stopped at the light at Broadway and Pershing. The front Union Station parking lot was full, but I manufactured a spot, and as we walked into Union Station, men in coats and ties and women in glittering dresses were already starting to trickle out of the Grand Plaza. As I expected, no one was checking people in or collecting money at that point, so we walked right in. Lights were flashing, hundreds of people were drinking and mingling and scores were dancing to the music of Dave Stephens and the Kansas City Jazz Orchestra. We navigated through the crowd and got close to the stage and dance floor. Even though the sound in that cavernous room is always terrible, it was an enthralling scene and, indeed, it was as close as I was going to get, in Kansas City, to Times Square. We stayed until the last song, Puttin’ on the Ritz (written by Irving Berlin in 1927), and then started working our way back toward the front of the room to leave. Out of Patty’s view, I pulled a $10 bill out of my wallet as we walked and held it in my left hand…Unless we saw someone we knew within the next minute or two, I was going to owe her $10. Then she remembered. “Oh,” she said and reached out and took the bill. We hadn’t walked more than another 20 to 25 feet when Patty slowed and approached a waitress who was standing off to one side. Patty handed the waitress the $10 bill and exchanged a few words with her. Nodding and smiling, the woman thanked Patty. Yes, it was a great New Year’s Eve. Every day is great when you’re with someone like that. So fun to read about your celebration. I ALWAYS celebrate under the covers. You’re making me feel OLD!! Happy new year to both of you. Mike will be in KC for the Chiefs playoff game in two weeks. He wants to go with Oliver. I’m going to keep fighting to ring in the new year anywhere but under the covers as long as I can, Marcie…Happy New Year to you, and tell Mike to at least give me a call when he’s here. I didn’t know he was a big football fan. Sweet, both of your actions. You know, fitz, the tickets would be tax deductible for your blog. Thanks, Tracy…But I wasn’t about to pay $240 to spend the entire night with a bunch of strangers! Thanks, Lisa. I hope your holiday concierge business gains momentum in 2019. Love your story and yes, you do have a special wife! Thank you, Gloria. You and Patty are cut from the same cloth. Gerald and I are very lucky. Great post. Fun to read. Hope you are doing well. Your tour of the KC Museum will be realized shortly. Happy new year. Great fun to read, and the “your” for “you’re” suggests the attachment you and Patty have for each other. Happy New Year — and to another year of great blog posts! Thanks, Vern…Just a grammatical mistake. I meant to check that and didn’t. What a wonderful story. I like that Patty! In our case, Alice, Patty wasn’t too interested in going out, and for once it was me putting the plan together and agitating to stay out late. I was kind of proud of myself for that…Happy New Year to you and Joe! Nice story, Jim! Happy New Year! Thanks, Regina…Happy New Year to you…See you soon. I, quite by accident, wandered into Tasso’s in Waldo, out in your neck of the woods looking for New Years “atmosphere.” The place was filled with Mission Hills/Brookside families (6:30 show) who dressed their kids (about 75 of them) in Nordstrom style outfits. We had to wait for a cancellation to get a table, and was told that New Years sells out 6 months in advance. Quick summary: Smashing plates at $3.00 each, strolling violinist, belly dancer, “old men, Godfather-like characters in overcoats,” kids running wild, 2 man band played KC and the Sunshine Band.” A pretty good time…ran into my niece, her husband and her 2 kids. You don’t hear much about that place but it just keeps rolling along, with a strong, loyal following. That’s a nice account of running across a good time unexpectedly. I’m glad you enjoyed it. So you started the new year off by stiffing Union Station for $240.00? I wouldn’t exactly say that, John…How about this: I was prepared to pay, if necessary, but when we got to the entrance no one was there to accept our money…Was I obliged to seek out an authority figure and insist that he or she take our money? That’s the question I’ll have to struggle with the rest of my life.